November should be called "Benchmark Testing" month, because everything is scheduled around testing and the Thanksgiving holiday week. 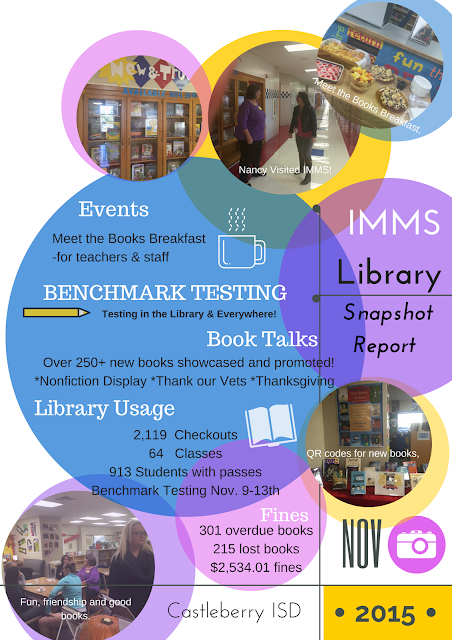 Regardless, we had a busy month in the library hosting over 64 classes and we checked out over 2,000 books! We received and processed over 250 new, beautiful books and were able to showcase and present them to the students and faculty. The faculty attended a "Meet the Books" breakfast. The month was short, but packed with fun!